Read this MX Select MX55 Adjustable Dumbbells review to find out if this is the best adjustable dumbbell set for you. I'll tell you all about the MX55's key features, its pros and cons, alternative dumbbell sets to consider and everything else you should know before deciding to buy this set. Are the MX Select MX55 Adjustable Dumbbells Worth it? They also come with a dumbbell stand with built-in weight storage/change trays. IMPORTANT: Make sure you put the stand on level ground, and do not prop the front or rear legs up to tilt the stand to a different angle. If the dumbbells aren't parallel to the floor while in the trays, you'll likely run into hiccups when adjusting the weight. The dumbbells stands, including the tray portion on top, are made entirely from steel. The construction is top-notch on this thing. The design is very sleek and elegant. The stand's footprint is quite compact, too. 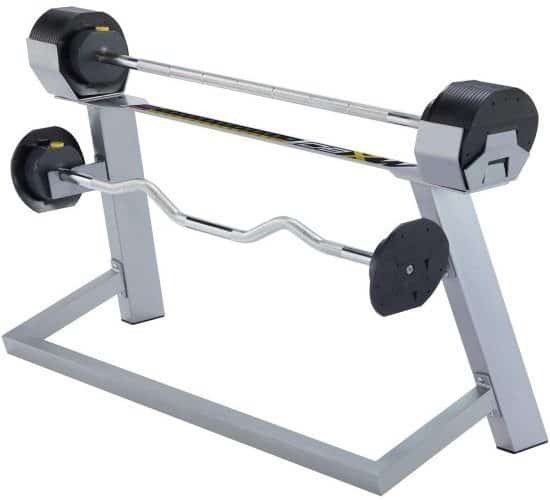 With modest dimensions of 18.74″ Length x 22″ Width x 30.675" Height (47.6 cm x 55.9 cm x 77.9 cm), it won't take up too much space in your home gym area. You cannot buy the dumbbells without the stand, in case you were hoping to do so to save some extra money. They are only available together. More importantly, you need the stand to properly adjust the dumbbells. The trays on the top of the stand hold the unused plates upright, at the exact angle needed to for them to line up and interlock with each other and the dumbbell handle. As you can see from the photo above, the last plate on each end of the dumbbell locks into the two inserts on the end of the tray. This locks the end plate in place, and subsequently every other plate, since the plates interlock together. 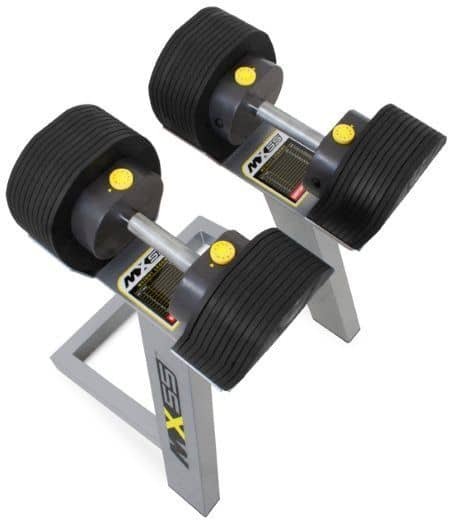 The MX80 adjustable barbell set is commonly bought together with the MX55 adjustable dumbbell set. To be clear, the MX80 is not an add-on or accessory for the MX55. It's a completely separate product. But it is a complementary product to the MX55, so I wanted to include it in this review for anyone interested. As you can see from the photo above, the MX80 has a very similar look the MX55. It has the exact same adjustment mechanism, too. Adjust in 5 lb (2.25 kg) increments for weight settings where the weight is equal between the left and right side. However, you can adjust in 2.5 lb increments if you have one extra plate on one side, since each side is adjusted independently; in this case, the weight would be slightly uneven between the left and right side, so you'd have to move your grip position slightly to one side to counter the imbalance. In terms of price, the MX80 is certainly on the premium end. However, assuming it works as well as the dumbbells, it's a quality product that might be worth it for the right buyer. 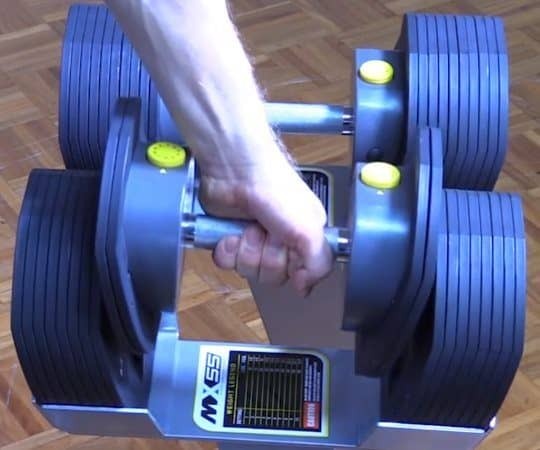 ...PowerBlock has a similar concept: They sell a straight bar handle and an EZ-curl bar handle that you can attach between a pair of their dumbbells. This is a pretty creative idea that accomplishes the same basic functions as the MX80, albeit with less style and sleekness. It can also be much less expensive IF you already have the correct PowerBlock dumbbell or were planning on getting a pair. If you're interested, just know that they're only compatible with certain models: Pro 50 and Pro EXP (and the now-discontinued U50, U70 and U90 sets). Adjusts from 10-55 lbs (4.5 - 24.9 kg) per dumbbell. If you don't think you'll ever need more than 55 lbs., this can be an excellent choice. I really wish they had a model that went to higher weight range for more serious lifters like myself. Learning that they didn't have this was a disappointment for me, since there's so many other things that this dumbbell set gets right. The MX55 adjustable dumbbells are designed to adjust in 5 lb increments. However, you can technically use as little as 2.5 lb increments since you can adjust each end independently (each plate is 2.5 lbs). If you do use a 2.5 lb increment, just know that the dumbbell will be slightly imbalanced between the left and right side. That's not a huge deal though because you can simply adjust your grip position slightly to counter the weight asymmetry. Let's say you wanted to use 17.5 lbs -- You'd just adjust one dial to setting #2 (15 lbs) and the other dial to setting #3 (20 lbs). 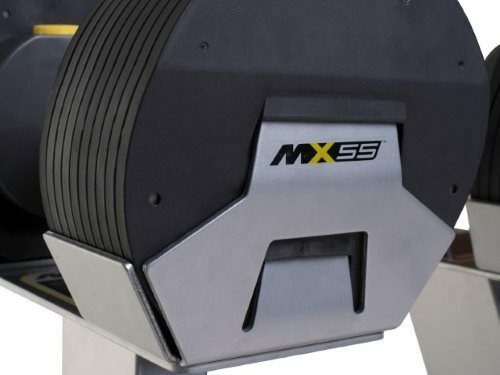 The MX55 adjustable dumbbells use a unique adjustment mechanism that works very effectively and consistently according to all available feedback. Now, I'll attempt to describe exactly what's going on. This is a a rack and pinion design. 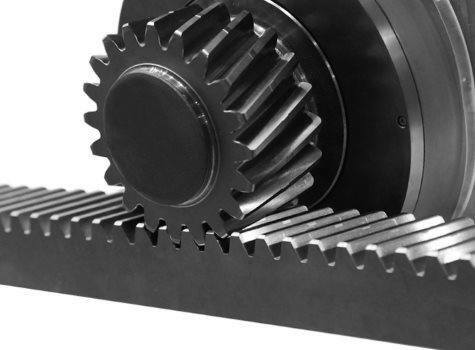 "Rack and pinion" is a mechanical term, which refers to a [pinion] gear that connects into gear teeth on a straight bar or rod (called a a rack). If the gear turns one way, it drives the rod forward; if it turns the other way, it retracts the rod. 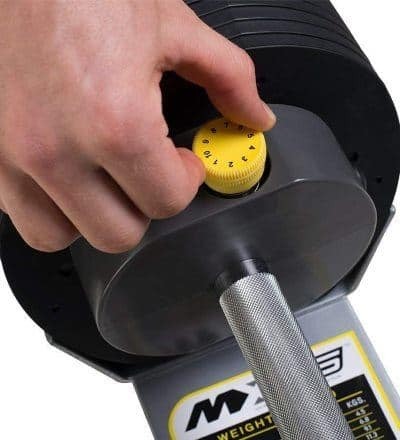 In the case of the MX55 dumbbells, there is a small yellow dial on top of the enclosure on each of the handle ends. This dial is connected to and controls the pinion gear, which is housed inside the enclosure. To add or remove weight, you must turn the dial/pinion gear to extend or retract the weight selector rod (i.e. the rack). However, before you can do that, you must first unlock the selector rod. You do this simply by pressing the small round black button on the side of the enclosure on the handle end. After selecting the desired weight, you just have to lock the selector rod in place so it doesn't move during use and allow plates to fall off. It's easy -- just press the yellow dial down until it is clicks into place just above the enclosure's surface. Next, just repeat the process on the other side of the dumbbell, and then on the second dumbbell. All in all, it takes 5 seconds or less to adjust each dumbbell -- it's very quick. More importantly, if you have the stand and trays set up correctly, it's rare to experience issues with the adjustment mechanism. Adjustment mechanism problems (e.g. selection rod jamming, dial not turning, having to jiggle the dumbbell/plates) a common complaint about many of the selectorized dial-based adjustable dumbbell systems (e.g. Bowflex 552) and sliding pin systems (e.g. Bayou Fitness adjustable dumbbells). ...The interlocking plates. I've discussed these earlier, so I won't go too in depth. 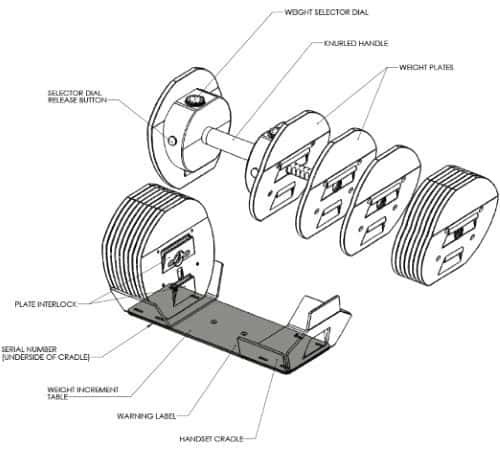 However, to understand the adjustment mechanism in its entirety, it's important to realize that the plates' ability to interlock is essential to all plates staying attached to the dumbbell handle and not falling of the selector rod during use. The way they lock together is secure, with two different locking points (tab into slot) on each plate. The only way the plates come apart is when you want them to -- when you're adjusting the weight. You do so by pulling the handle straight up when the dumbbell is locked in the stand trays and the selector rod is unlocked and retracted. All reports indicate it works fast, efficiently and consistently. It also lets the dial be very small and out of the way -- in the handle enclosure; not a large dial on the end of the dumbbell that can get in the way, like on other models. It allows the dumbbell length to get shorter or longer when you remove or add weight. Use the included Allen key to loosen the four bolts on one end of the tray, located on its underside. Because these bolts are in slotted holes, this end of the now-loosened end of the tray will be free to slide forward or back, increasing or decreasing the length of the tray opening. 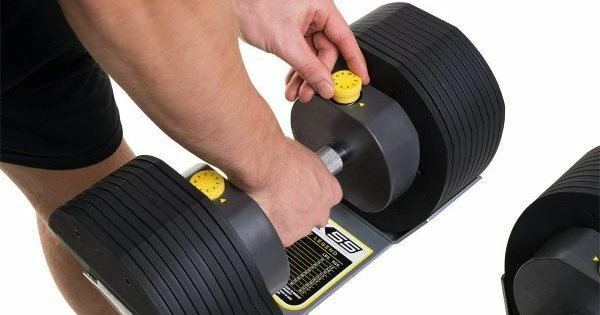 Now, take a fully loaded (55 lb) dumbbell and put in and out of the tray multiple times -- This allows the tray to adjust itself to the optimal length. To test if it indeed finds the ideal length, adjust the dumbbell to 35 lbs and remove it. It should come out smoothly with no unselected plates hanging on. If it doesn't, keep playing with the tray length. Once adjustment and removal is seamless, re-tighten the bolts. When removing the dumbbells from the trays, always lift the dumbbells vertically out of the trays. Pulling them out at an angle may cause unselected plates to stick on the end. Make sure the stand is on level ground. Don't prop up the front or rear legs to tilt it to a different angle. And you should even make sure that it's on even ground. Having it totally flat helps ensure the adjustment mechanism works properly. Clean the plates every few months with some type of disinfectant spray and use a lint-free cloth to dry. The point is to remove any dust or other build-up. You can optionally use Armor All or a comparable product to give it a nice shine to keep them looking as new as possible. From my research, it seems that this adjustable dumbbell -- compared to all others -- is probably the closest you'll get to the look and feel of a traditional fixed dumbbell. 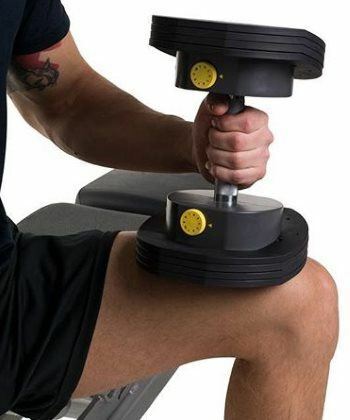 ...Balancing the dumbbells on your thigh like this is much more awkward or uncomfortable on other adjustable dumbbell systems like the Bowflex 552 or any similar models with the dial is on the dumbbell's end. In the case of spin-lock dumbbells, it's simply not possible since you'd just have a 1 inch metal rod poking into your thigh. The (mostly) circular plates makes the MX55 adjustable dumbbells look very similar in shape to the traditional fixed dumbbells you'd find in a commercial gym. All plates have the same diameter, so the weighted portion of the dumbbells are uniform in shape from the first plate to the last. When you have more weight loaded on, each end looks like a big cylinder connected to the handle. Compare this to other adjustable dumbbell systems (i.e. 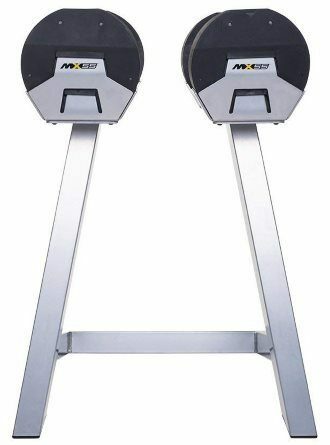 Merax adjustable dumbbells, Bowflex 552, etc.) that are more cone-shaped. They have larger diameter plates closest to the handle with progressively smaller plates toward the end. The ends of traditional fixed dumbbells of course have a uniform, cylinder-like shape; not a tapered, cone-like shape. 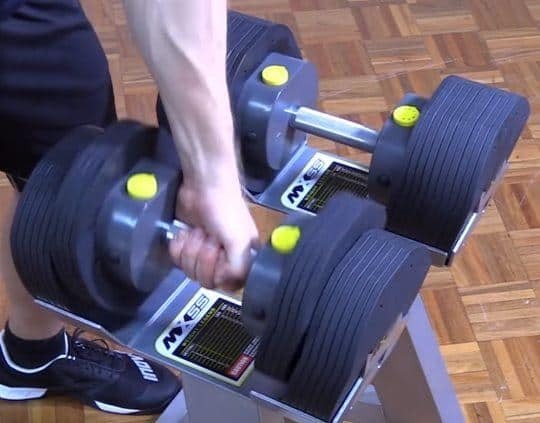 The fact that the plates are so close together and that their edges are flat (rather than rounded) makes each dumbbell ends look like one continuous block of weight, just like any traditional fixed dumbbell. Many other systems have obvious gaps between plates, and rounded edges that make those gaps appear even larger. These factors ultimately give them a ribbed and discontinuous appearance. Unfortunately, the MX Select MX55 adjustable dumbbells are more on the premium end of the market. As a comparison, you're in the same price range as other "premium" adjustable dumbbell systems that also have higher max weights, including the 75 lb Ironmaster set + stand, and the 90 lb Elite 90 PowerBlock (without the stand). ...Later on, I'll tell you how to decide if this dumbbell set is worth the price for you. All the major parts are metal/steel. 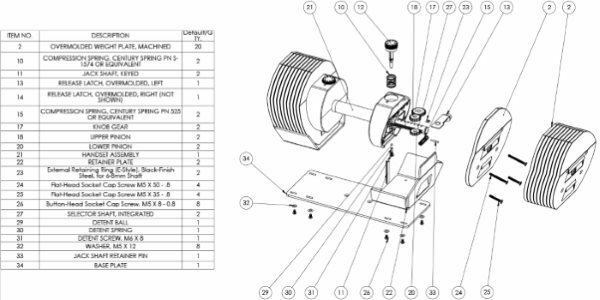 This includes the plates, the handle, and the rack and pinion gear adjustment mechanism. This goes a long way in terms of extending the dumbbells longevity compared to having a lot of small moving plastic pieces. There are plenty of other adjustable dumbbells on the market that use a lot of plastic pieces, and predictably are much more prone to breakdowns, even under normal use. 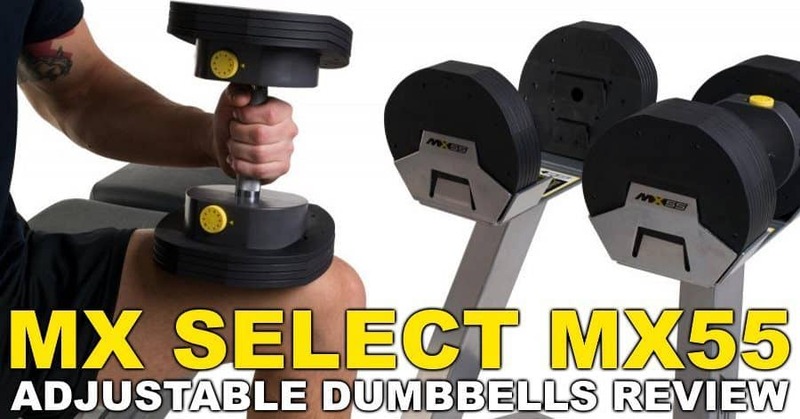 As with any selectorized adjustable dumbbell, you can't be rough with these dumbbells. The fact of the matter is there are moving gears, which can be damaged from impact, even if they are well-constructed and made from steel. Don't use the dumbbells to support your body weight (e.g. using the handles for push ups). Don't slam the dumbbells together at the top the rep on exercise like chest flyes, shoulder press, bench press, etc. Don't try to hit the unlock button and/or turn the dial when the dumbbells are outside the trays. Don't lift the dumbbells by grasping the plates; use the handle only. There are 36 plates total that come with dumbbell set; that means 18 for each dumbbell. That's not including the four plates that are permanently attached to the dumbbell handle ends (one on each end of each dumbbell). All plates weigh 2.5 lbs. The plates are pretty much circular, except at the top and bottom, which are flat. This flat portion prevents the dumbbell from rolling if you set them on the floor. It also keeps them stable in the bottom of the dumbbell trays. Each weight stack on the ends of the dumbbell is about 4 inches (10.2 cm) long when all the plates are loaded on the handle. The amount of play between the plates is minimal thanks to the thin, flat shape. Also, the interlocking design of the plates not only keeps the plates as close to each other as possible, it also keep inter-plate movement to an absolute minimum because they're attached to each other. Because of these factors, there's little to no rattling of the plates with during use. ​You may hear some light clicking of the plates together, particularly if accelerating the dumbbells on exercises where you're using a quicker tempo. The plates are made of steel, with an a heavy duty hard nylon compound wrapped around the surface via an injection moulding process. First and foremost, this nylon encasement provide a layer of protection against scratches or dings during normal use that could happen to the plates, the stand or to the floor. If there's going to be a (minor) impact, this plastic will prevent or reduce any visual imperfections compared to the same impact but with bare steel plates. 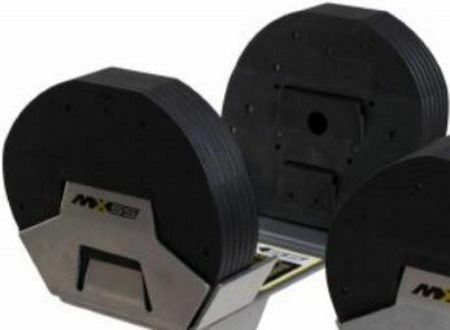 Second, the nylon coating also greatly reduces noise from inevitable plate-on-stand and plate-on-plate contact when put the dumbbells back in the trays with the unselected plates. ​Similarly, if there is any slight movement of the plates against each other while in use, any noise will be blunted -- so you'd hear more of soft click rather than a loud clang if it were bare steel. As you can see from the photos above, there are two tabs on the inside of each plate and two slots on the outside of each plate. The tabs of each plate insert into the slots of the next plate. There are tabs on the ends of the trays -- these tray tabs insert into the slots on the outside of the last plate on the dumbbell. These tabs and slots give the plates their interlocking design, which is a major part of the MX55's adjustment mechanism, which I'll discuss later. The MX55 dumbbells are perfectly balanced, which is one of the key factors that gives them the "feel" of a traditional dumbbell. They weight is evenly distributed between the left and right side for all 5 lb increments. Some lower quality adjustable dumbbells will claim 5 lb increments, but that means adding 5 lbs to just one side, thereby making the dumbbell uneven. 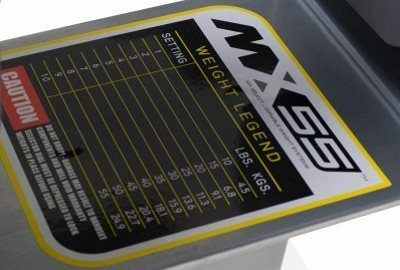 Now, as I discussed previously, you can achieve even smaller increments of just 2.5 lbs with the MX55 by adding an extra 2.5 lb plate to just one side; in that case, they would be slightly imbalanced but you might not even notice since it's such a light weight. If needed, though you could just shift your hand a bit to counteract any sense of imbalance. The weight is evenly distributed from top to bottom. This is possible because the adjustment mechanism and the handle are exactly in the center of the weight plates. And the weight plates themselves are one solid piece and thus well-balanced. This is in contrast to the Bowflex-style selectorized dumbbells, which are notched to allow the handle insert into their center. Selectorized dumbbells that adjust via large dials on the ends (e.g. Bowflex, Merax) can feel somewhat awkward or unstable in the hand. This is because the dumbbell is very long, even at lower weights. Plus, the plates are spread around in an odd way on many of their weight settings (i.e. some at the end, some in the middle or front, with large gaps in between. The MX55 is short at light weights and gets longer as you add weight. This makes it feel more stable and balanced. 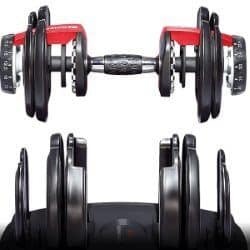 As discussed in the bullet point above, this photo shows the odd way plates are spread out for some weight settings on Bowflex or similar adjustable dumbbells. The dumbbell length is variable, meaning it's shorter with less weight and becomes longer as you select heavier weights. This makes it feel like you're holding an appropriately sized dumbbell, regardless of the weight you're using. The length of each dumbbell at the minimum weight of 10 lbs is just 9.84 inches long (40.5 cm). The length at the max weight of 55 lbs is just 15.94” long (40.5 cm). Overall this is a very compact adjustable dumbbell system. Among selectorized adjustable dumbbells, this is one of the most compact sets you'll find. 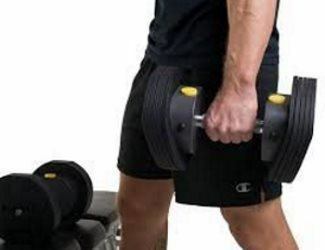 The PowerBlocks which are a different style of selectorized dumbbells, are shorter pound for pound, but they don't resemble "traditional" dumbbells. Similarly, the Ironmaster adjustable dumbbells are also notably shorter at every weight setting, but they're also not selectorized adjustable dumbbells. Compared to all others adjustable systems out there, though, the MX55 are the most compact I've come across. It has knurling throughout the grip area. And it's a straight handle; not contoured. The handle diameter is 1.14 inches, or 29 mm, which is the exact thickness of any official powerlifting barbell. It's also right in the range for typical dumbbell handle thickness. The usable handle length is 5.21 inches (13.2 cm), which gives plenty of room to grasp the handle with enough room to shift your hand left or right as needed for certain exercises. 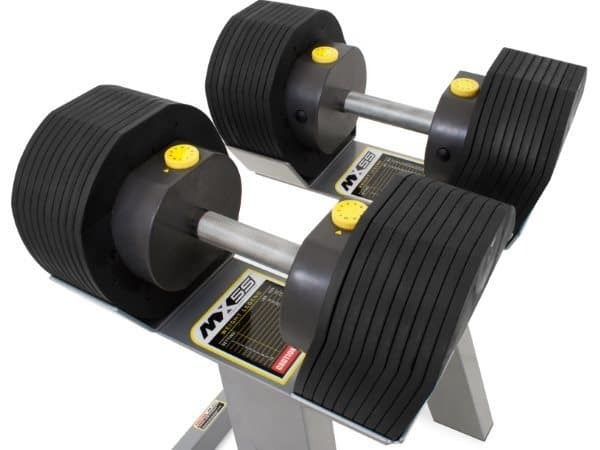 The MX Select MX55 adjustable dumbbell set come with a 2 year warranty for parts and labor. This covers both the dumbbell handles (with the adjustment mechanism enclosure) and the weigh plates. As is standard practice, the warranty is void if you drop the dumbbells. The fact that they have a 2 year warranty is another sign this is a quality product. You won't find any other adjustable dumbbells that use small moving parts/dials/gears with a longer warranty. There are a few others out there that offer a 2 year warranty, too (i.e. Bowflex, Merax). However, most others have only a 1 year warranty, or even less! There are others out there with much more robust warranties, such as PowerBlock (10 year to lifetime depending on the model) and Ironmaster (lifetime). However, they're completely different types of adjustable dumbbells -- most importantly, they don't have small moving parts, and thus durable enough for a 10+ year warranty to be feasible. But if you're still unsure about the MX55, read on. I'll walk you through some other considerations that will help you come to the right choice. If you want a rapid adjustment mechanism that's simple to operate and won't get in your way during use. If you want a dumbbell that looks and feels as much like a traditional fixed dumbbell as possible. If you're okay with having a max weight of 55 lbs per dumbbell. Consider that even if you can't lift that much now for most exercises, you may be able to in the future when you're stronger. These are more durable than the MX55 because they have no moving parts and a simple yet robust nested frame design. Although you're not supposed to drop PowerBlocks, they're more likely to survive the impact unscathed than the MX55 in the case of an accidental drop. They are definitely not a traditional looking dumbbell. As you might guess from the name, they look more like a block than a typical dumbbell. Despite their non-traditional design, you're able to use them for all the same things you use traditional-looking dumbbells for. Adjusting is fast with the PowerBlocks. The MX55 will be slightly faster, but it's comparable. Depending on the model you get, they are expandable to a max weight of 90 lbs per dumbbell. Much more than the MX55 set. Need more info? Read my PowerBlock dumbbells review here. These are very natural looking and feeling dumbbells like the MX55. However, they plates are square rather than circular. The base set is 75 lbs per dumbbell, which is already 20 lbs higher than the max weight of the MX55 dumbbells. However, you can expand the weight even further, to 120 lbs with one add-on kit, and again to a massive 165 lbs with a second add-on kit! I wouldn't consider the Ironmasters' adjustment time to be "slow" per se. They are much faster than spin-lock dumbbells. However, they are significantly significantly slower to adjust than the MX55 set. What they lack in speed, they make up in durability. While it's not recommended, I have dropped my Ironmaster pair many times with absolutely no issue. Everything is steel and cast iron. There are only a few parts -- they're all large and none move. Need more info? Read my Ironmaster Quick-Lock Adustable Dumbbells Review here. These three all have the same basic design: large dials on each end of the dumbbells, which you turn to adjust the weight. They all take a similar amount of time to adjust as the MX55 dumbbells; certainly the Merax one is faster since you only have to turn the dial on end rather than both ends. While they're as fast or faster at adjusting as the MX55, they're also more prone to occasionally jamming, which adds a bit of extra time and frustration when it happens. Still, most of the time they're pretty reliable. These are not traditional looking dumbbells like the MX55 are. The dumbbell length does not get shorter with less weight and longer with more weight. It's the same length with no plates added as it is with all plates added. This can make it somewhat awkward to use at lighter weights, and/or with exercises like curls and lateral raises where you need to bring the dumbbells by your sides or in front of your thighs. The max weights are different for all three of these: At 52.5 lbs per dumbbell, the Bowflex 552 is closest to the MX55's max weight of 55 lbs. The Merax Deluxe gives you 16.5 lbs more weight per dumbbell, with a max of 71.5, which would satisfy a good number of home gym lifters. The Bowflex 1090 goes highest, with an impressive max weight of 90 lbs per dumbbells, which would make most strong lifters happy. As far as price goes, the Bowflex 552 and Merax Deluxe are closer to half the price of the MX55 adjustable dumbbells. The Bowflex 1090 is in about the same price range as the MX55. A dumbbell stand is optional for all of these; you don't necessarily need one, but it's helpful. You can purchase one separately for a reasonable price if you want one. 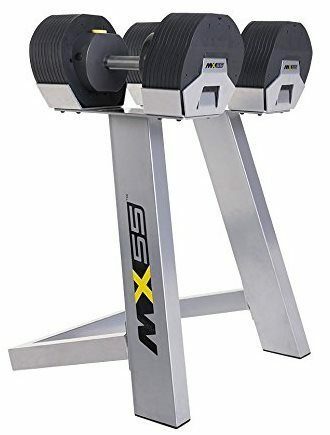 Hopefully my MX Select MX55 adjustable dumbbells review has taught you everything you need to know to make an informed decision about this dumbbell or any of the top alternatives. Whichever dumbbell set you end up buying, I hope you enjoy it and the awesome workouts to come!